Residents near Agate Beach in Oregon were shocked when they saw a 66-foot long dock had washed ashore. The massive dock was spotted earlier in the week floating offshore, a mile north of Newport, according to the Oregon Parks and Recreation Department. And upon closer examination it was clear that it wasn't just your ordinary ocean debris. The placard, bearing Japanese writing, gave them a hint. 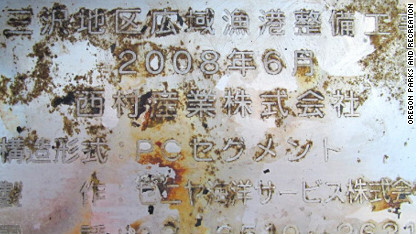 A metal placard bearing Japanese writing was found attached to the dock. Instantly the question was: Is this another giant piece of debris from the tsunami in Japan last year that's made its way to U.S. shores? It certainly wouldn't have been the first time - and likely won't be the last. Debris from the March 2011 tsunami in Japan began showing up on western U.S. shores in recent months. After some testing and translation officials confirmed that the derelict dock was indeed debris from the 2011 tsunami in Japan, the parks department said, citing the Japanese Consulate in Portland. The parks department said they were able to trace the dock back to Japan after having the local Japanese consulate translate the placard which reveals a company name, location and phone number. Havel added that tires on the dock were determined to have come from a company in Japan. And officials testing plants and wildlife found on the dock learned they were native to Japan. At first residents were told to stay away from the giant dock, which is 7 feet tall and 19 feet wide. The dock, made of concrete and metal, posed concerns about whether it might be radioactive at first. Oregon parks spokesman Chris Havel told CNN that officials tested the dock for radiation but the tests were negative. There have been concerns that tsunami debris from Japan could be contaminated by radiation because of problems at Japan's Fukushima Daiichi nuclear plant. But the National Oceanic and Atmospheric Administration has said that it is unlikely that radioactive material will make landfall in North America. - CNN's Linda Hall, Shawn Nottingham and Casey Wian contributed to this report. What a waste!!! It can hold hundreds of illegal immirgrants on it. They were "shocked"??? Surprised, maybe, but I doubt they were shocked. A bit of extra hype CNN?? give it back to the chinks. Vote Phillip Anthony Biondo for President 2012 of the Fraternity Party! Brandon Gilligan USN for VP. Free College like k-12. Free Healthcare. All safe drugs, as determined by doctors, prescription and illegal will be legal. Fraternity party: Lets all move to california and secede from the union. We have nothing left to loose but our chains. There must be a large air cavity in there for a metal and concrete dock to float that far without sinking.